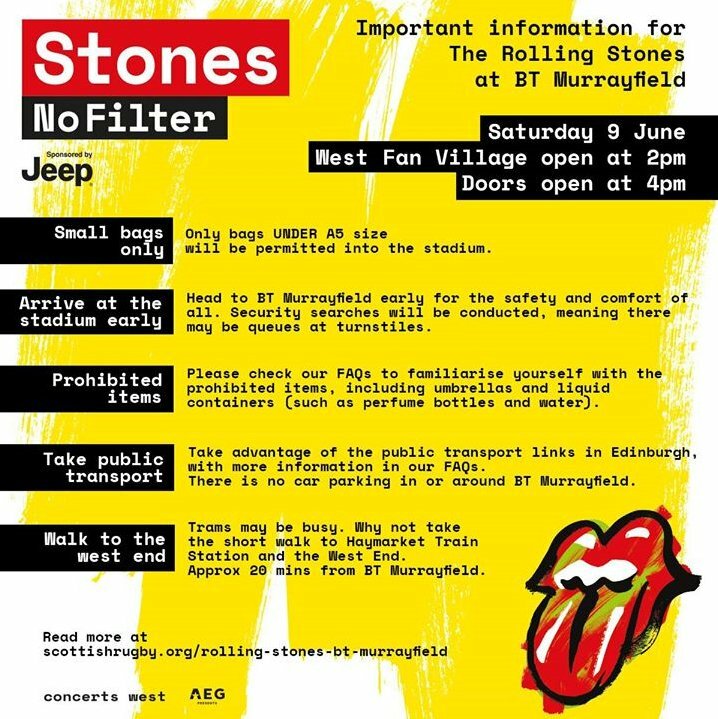 This thread is for live updates and comments regarding The Rolling Stones No Filter show in Edinburgh UK 9-June-2018. Based on last night, the entire show will be in daylight. Does anyone know what time LDs can be collected? Beautiful morning here in Scotland. Perfect day ahead. Can,t wait to see the Stones rock Edinburgh tonight.Is everybody ready? Just popped out to get my paper, and the weather is very nice. Going with my son Scott, his first Stones show, and my friend Ron, a fellow Stones fanatic who I've known since our school days. A few pints and then on to see The Greatest Rock 'n' Roll Band In The World. Sun is shining here in South Queensferry, about 20 minutes from Murrayfield. Hope everyone has a great day. Glasgow also basking in the sun this morning. Taking my 11 year old son to his first Stones gig today. Heading for the train in a couple of hours then we'll get some food and drinks in Edinburgh before heading to Murrayfield. Looking forward to it. There seems to be a good buzz about this one. Everybody have a great concert tonight, rain or shine!! Sun at this time ! Taking the tram to pick up our tickets shortly. Was in a bar last night on the royal mile. The singer got a complaint for playing too many Rolling Stones songs. The complainant was invited, in quite coarse terms, to take his leave. Lots of fans wsiting at the stones hotel.keefs guard came out just. Does anyone know if there is some sort of que up for the golden circle or pit? I'm ready, ready as anybody can be. I'm ready for you, I hope you're ready for me! The spirit of Muddy Waters got me there. Great night in The Village last night. Lots of happy Stones fans. Thanks to the boys in the band for providing the music . "How I Wish " was an absolute treat. StarStar too. Lots of folks lustily singing along. Having a nice leisurely start to the day 40 miles West in my hometown of Hamilton, Lanarkshire and exact spot of a riotous Stones gig in 1964. Just picked up my LDs. It is a beautiful day today and still very quiet at the box office. And yes, got Pit A, very happy! So starting to get ready for the day. Any Good bar to visit before the show? Ronnie will be happy to see you ..
Gregorz67 - tis a pity you're a Hearts fan . I thought with 67 in your name, you may be a Celtic fan. As you know, 1967 is a very important year in Celtic's history. First British team to win the European Cup, or Champions League as it's now known, for the non fitba folks. Rod Stewart is a big fan. Say Hello if you see me in Golden Circle, wearing kilt. Steel Wheels tongue on back of leather jacket. Slainte! Gold rings on you all. Gonna be a great day! 4pm - see here: [iorr.org] .